This is a scalable context timeline. It contains events related to the event January 27, 2003: Richard Clarke Amazed at Zelikow’s Hiring by 9/11 Commission, Thinks ‘The Fix Is In’. You can narrow or broaden the context of this timeline by adjusting the zoom level. The lower the scale, the more relevant the items on average will be, while the higher the scale, the less relevant the items, on average, will be. Two Rejected Candidates - One name considered is that of James Hamilton (no relation to Lee Hamilton), who had been a lawyer on the Senate Watergate committee. However, he had worked on the 2000 Florida recount for Al Gore, so Kean rules him out. Another name considered is Carol Elder Bruce, but at her interview she says issuing subpoenas for documents the commission wants would be a good idea, although Kean and Hamilton have already decided against this (see January 27, 2003). Richard Clarke, counterterrorism “tsar” from 1998 until October 2001, ignites a public debate by accusing President Bush of doing a poor job fighting al-Qaeda before 9/11. In a prominent 60 Minutes interview, he says: “I find it outrageous that the president is running for re-election on the grounds that he’s done such great things about terrorism. He ignored it. He ignored terrorism for months, when maybe we could have done something to stop 9/11.… I think he’s done a terrible job on the war against terrorism.” He adds: “We had a terrorist organization that was going after us! Al-Qaeda. That should have been the first item on the agenda. And it was pushed back and back and back for months.” He complains that he was Bush’s chief adviser on terrorism, yet he never got to brief Bush on the subject until after 9/11. [CBS News, 3/21/2004; CBS News, 3/21/2004; Guardian, 3/23/2004; Salon, 3/24/2004] Author Philip Shenon will call the interview “gripping” and comment that Clarke is “made for television.” This is because of his “urgent speaking style” and his “shock of white hair and ghostly pallor,” which makes it look like he has “emerged from years of hiding in sunless back rooms of the West Wing to share the terrible secrets he ha[s] learned.” [Shenon, 2008, pp. 277] The next day, his book Against All Enemies is released and becomes a bestseller. [Washington Post, 3/22/2004] He testifies before the 9/11 Commission a few days later (see March 24, 2004). Republican Commissioners Ask Tough Questions - However, Clarke faces tough questioning from some of the Republican commissioners. Jim Thompson, who had been in contact with the White House before the hearing (see Morning, March 24, 2004), challenges Clarke over a briefing he gave in 2002 (see August 22, 2002 and March 24, 2004), which, according to Thompson, contradicts what Clarke is saying now. In addition, fellow Republican John Lehman confronts Clarke over what he sees as discrepancies between Clarke’s book and his private interviews with the Commission. 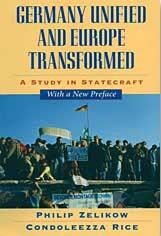 Clarke replies that the differences arose because the Commission did not ask him about all the issues he covered in his book, such as his opposition to the invasion of Iraq. He adds that he will not accept any position in any administration formed by Democratic presidential candidate John Kerry. 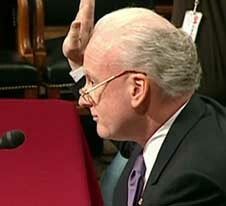 Former counterterrorism “tsar” Richard Clarke, lambasted by Bush administration supporters (see March 24, 2004) for his criticism of the administration’s foreign policies (see March 21, 2004 and March 24, 2004), counters some of that criticism by noting that when he resigned from the administration a year earlier, he was highly praised by President Bush (see January 31, 2003). 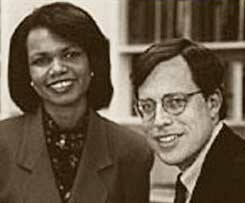 Philip Zelikow, the chief adviser to Secretary of State Condoleezza Rice (see February 28, 2005) and the former executive director of the 9/11 Commission (see Shortly Before January 27, 2003), writes a classified memo challenging the Justice Department’s legal justifications for its authorizations of torture. Zelikow writes his memo after gaining access to four secret memos from the Justice Department’s Office of Legal Counsel (see April 16, 2009), in his role as Rice’s policy representative to the National Security Council’s Deputies Committee. 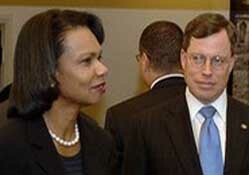 Rice and her legal adviser, John Bellinger, are the only others besides Zelikow to have been briefed on the memos. Zelikow was aware of what many of the suspected terrorists did, or were alleged to have done, through his experience on the 9/11 Commission. The evidence against most of them is “damning,” he will later write: “But the issue is not about who or what they are. It is about who or what we are.” In the memo, which he will publicly discuss four years later (see April 21, 2009), Zelikow focuses on three main areas of contention. First, the question should not be whether waterboarding (or any other particular technique) is torture, but on the idea of a program of authorized torture. The program used numerous well-planned, carefully considered methods of physical coercion to gain information from detainees, or as Zelikow will write, “to disorient, abuse, dehumanize, and torment individuals over time.” Waterboarding is only one of many objectionable, and illegal, techniques being used against prisoners. Ira Winkler. [Source: Canadian Broadcasting Corporation]Former NSA analyst Ira Winkler, author of the 2005 book Spies Among Us, writes of his disgust with the NSA’s domestic surveillance program, saying that because it is warrantless, it is illegal. He argues the program violates both the NSA’s rules of engagement and its long-term missions. Warrantless Surveillance is Illegal - Securing warrants under the Foreign Intelligence Surveillance Act is easily done, Winkler says: “FISA blocks no legitimate acquisition of knowledge. It doesn’t even slow the process down.” The problem, Winkler says, is that the program is so large that securing FISA warrants for every communication the NSA monitors “would [take] an army of lawyers to get all the warrants they’d need to be in compliance with FISA.” However: “[T]he law is the law. No president has the right to pick and choose which laws they find convenient to follow.” President Bush could have asked Congress to amend the FISA laws: “After all, after 9/11 Congress passed a wide variety of laws (without, for the most part, reading them) that were supposed to prevent another attack. They could have easily slipped something modifying FISA into all of that legislation. They did not, though recent revelations about this administration’s use of signing statements may indicate that they simply didn’t want to raise the possibility of questions.” Merely ignoring FISA “is illegal,” Winkler writes. Extortion - And the warrantless surveillance is not the only illegal action taken by the government. If the government did threaten one telecom firm, Qwest, for not cooperating (see February 2001), “[t]hat’s extortion—another crime.” Winkler writes that both Congress and the American people must demand answers, or the White House and the NSA will continue to usurp our freedom under the cloak of protecting freedoms. “[T]he NSA isn’t listening to the content of the calls, so there’s no harm.” Aside from the fact that Winkler believes the NSA is lying about not listening to the calls themselves, he says: “[The NSA] doesn’t need to hear your chatter to invade your privacy. By simply tying numbers together—an intelligence discipline of traffic analysis—I assure you I can put together a portrait of your life. I’ll know your friends, your hobbies, where your children go to school, if you’re having an affair, whether you plan to take a trip and even when you’re awake or asleep. Give me a list of whom you’re calling and I can tell most of the critical things I need to know about you.” The NSA is made up of mostly “good and honest people,” but it has “more than its share of bitter, vindictive mid- and senior-level bureaucrats. I would not trust my personal information with these people, since I have personally seen them use internal information against their enemies.” Winkler reminds his readers that the Bush administration deliberately outed CIA agent Valerie Plame Wilson because her husband dared debunk an administration claim about Iraq (see November 20, 2007), and tried to undermine the credibility of former counterterrorism chief Richard Clarke when he spoke out against the administration (see March 24, 2004). The NSA could easily provide the administration with damaging information about other administration enemies.